With more than 50 tips, techniques, and lessons for creating beautiful illuminated letters and sophisticated lettering projects, The Joy of Lettering takes hand lettering to a whole new level. 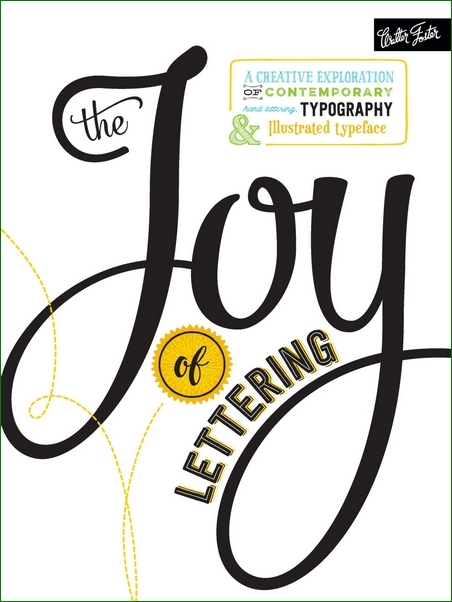 Gabri Joy Kirkendall (Creative Lettering & Beyond) and Jaclyn Escalera guide readers through a dynamic exploration of the craft, focusing on typography and illuminated letters and numbers using pencil, ink, and marker in a variety of styles and themes. From there, artists will learn how to create letters using a variety of alternative materials and media, such as watercolor, gouache, and wood. Easily customized DIY projects invite artists to finesse their skills as they learn to letter on different types of surfaces while creating lettered murals, stationery, and signage. Packed with creative techniques and easy-to-follow lessons, this all-inclusive resource is a must-have for anyone who wants to learn or grow their expertise in the art of hand lettering.